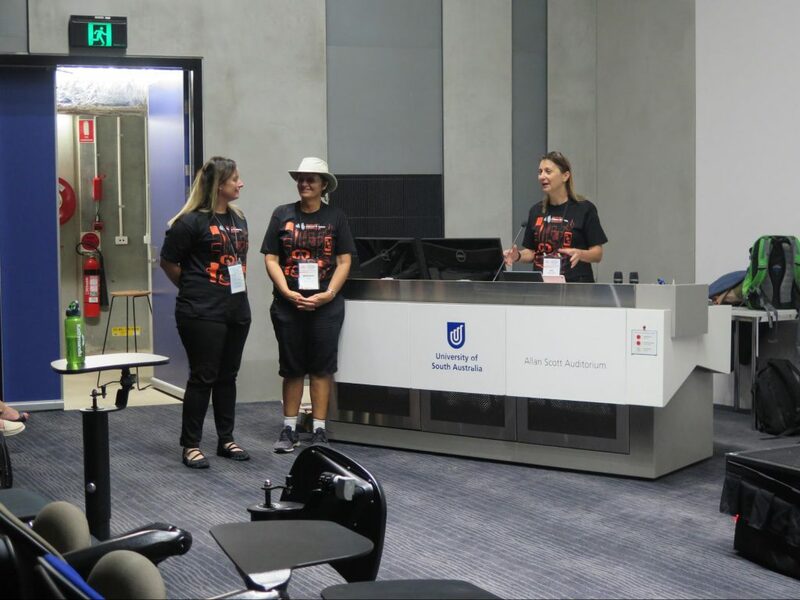 An epic adventure through the wild world of citizen science kicked off on Adelaide’s City West campus of the University of South Australia on 7 February 2018 with the start of Australia’s second national citizen science conference. 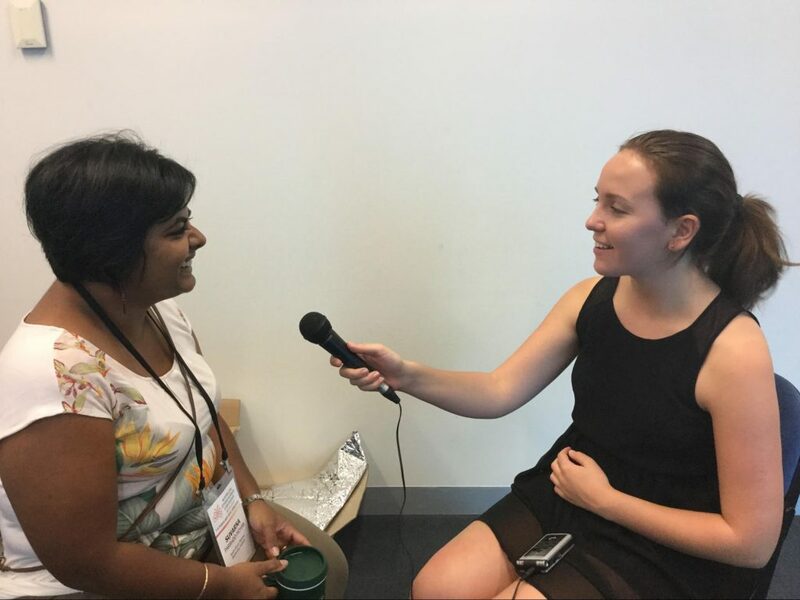 The conference brought together citizen science practitioners, participants, thought leaders and decision-makers, with the aim of showcasing best practice in citizen science and sharing project outcomes from across Australia and around the world. You can find out all the information about the presentations and workshops of #CitSciOz18 here and the Book of Abstracts can be viewed here. There were over 125 talks, posters and workshops falling within the conference themes of #SocialResearch (8 presentations), #EngagingCitizens (20 presentations), #Education (6 presentations), #Communication (4 presentations), #EmpowerWithData (19 presentations), #FieldProjects (14 presentations), #ShowcasingOutcomes (16 presentations) and #Partnerships (15 presentations). The conference was buzzing with discussions around the interplay between social outcomes, building an understanding of current initiatives, and harnessing technology to increase participation, improve data management as well as maximizing scientific and societal outcomes. Workshops also explored topics such as artificial intelligence, participant experiences, policy, social impact, bioblitzes, gamification, and data management. Our 250 delegates included representatives from the U.S. Citizen Science Association, European Citizen Science Association, Citizen Science Asia and all the State offices of Inspiring Australia — just to name a few. Delegates came from every state and territory of Australia, including the Australian Capital Territory (19), New South Wales (48), Northern Territory (1), Queensland (37), South Australia (77), Tasmania (2), Victoria (39) and Western Australia (13). We also had a number of delegates from overseas such as Austria (1), Germany (1), Hong Kong (1), Ireland (1), Israel (1), Netherlands (2), New Zealand (2), Scotland (1), South Africa (1) and the United States of America (4). Attendees also contributed via pre-recorded videos from the United Kingdom and Kenya. We were very pleased to be able to award 14 scholarships to students, community members and indigenous participants to the value of $9,000! From #CitSciOz18 Policy Sessions to a Meeting in the Capital! 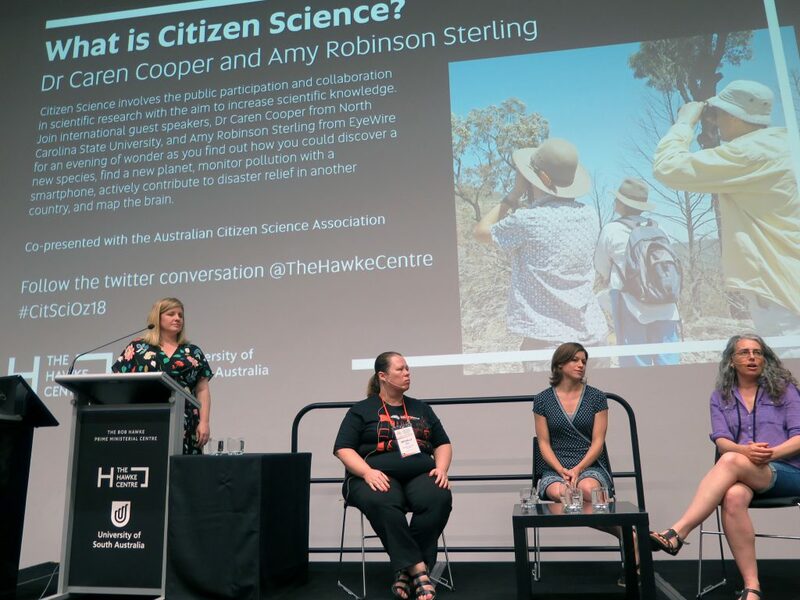 The conference included a fantastic two-part session highlighting citizen science policy development and impacts on society, which was championed by Libby Hepburn and had over 120 delegates in attendance. The session kicked off with inspiring pre-recorded videos from Professor Alexandre Caldas, with United Nations Environment Programme (UNEP), and Martin Brocklehurst, an independent environmental consultant in the United Kingdom and founding member of the European Citizen Science Association (ECSA), providing inspiring visions for citizen science to combat worldwide issues through global citizen science partnerships. The recent United Nations Science-Policy-Business Forum, which Erin Roger, our fearless ACSA chair attended and blogged about, and initiatives such as the Citizen Science Global Partnership (“Citizen Science Global”) and Global Mosquito Alert Consortium were highlighted. Martin also shared the commitment adopted by the Global Citizen Science Delegation to have 1 billion people participating in citizen science globally by 2020. Follow this via #1BillionCitSci2020 on Twitter! We all certainly have our work cut out for us, but let’s all do our part! Dr. Lea Shanley spoke to her learnings as a founder and co-chair of the Federal Crowdsourcing and Citizen Science Community of Practice for the United States, as well as her experiences during her fellowship developing open science and innovation research strategies with NASA. Dr. Amy Kaminski spoke about working in open science and innovation with NASA both as a program executive for Prizes and Challenges, and in the past, as a senior policy adviser for the Office of the Chief Scientist. 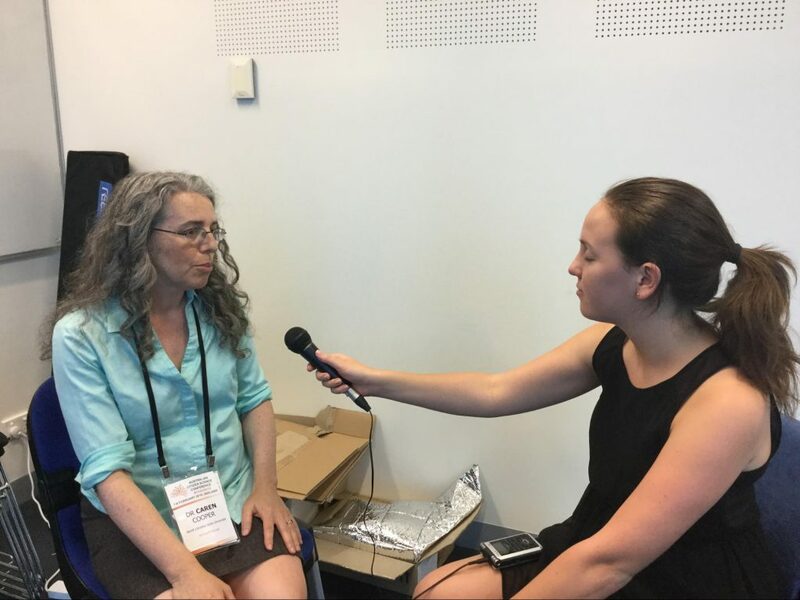 Jo White, Director Science Strategy, Science Division, New South Wales Office of Environment and Heritage, discussed how the state agency has harnessed the power of citizen science and developed an OEH Citizen Science Strategy, which is delivering on key science priorities. On Monday the 12th of February a forum in Canberra was held to share highlights from the conference with those who couldn’t attend in person. Lea Shanley and Amy Kaminski joined these sessions in the capital city to share their experiences on bridging citizen science and policy in the United States. Friday the 9th of February 2018 will go down in ACSA history as the launch of the first three regional chapters of ACSA! We welcome and congratulate ACSA Western Australia, ACSA South Australia, and ACSA Victoria! Representatives from ACSA WA were the first to stand up and introduce their regional chapter! ACSA Victoria sat down before the big reveal to talk “chapter and verse” about their new roles. 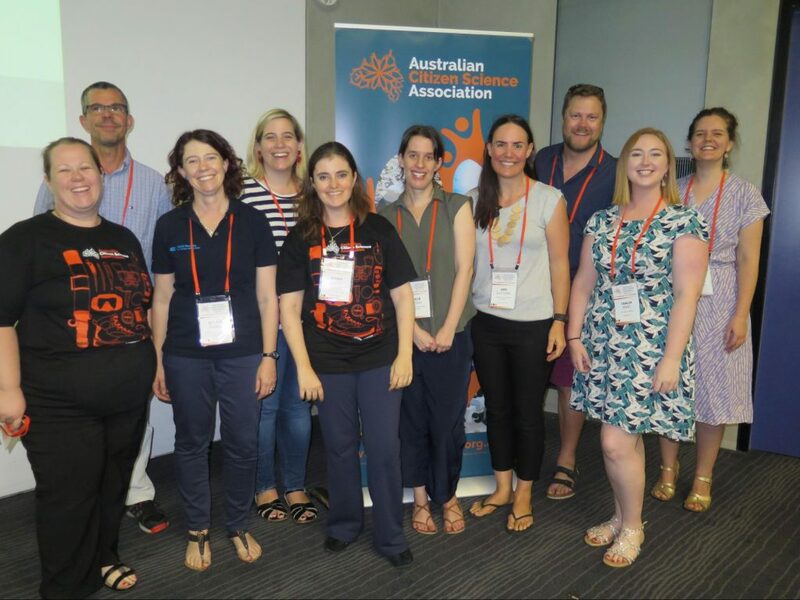 ACSA Chapters will play integral roles in fulfilling the vision to build an Australian community of practice that supports, informs, and develops citizen science. We hope that Chapters in Queensland, Northern Territory, Tasmania, and the Australian Capital Territory will be joining the ranks soon. The ACSA Data & Metadata Working Group, which will be chaired by Peter Brenton from the Atlas of Living Australia, was also introduced. It was also announced that Dr. Geoff Garrett, former Chief Scientist of Queensland, has agreed to be an ACSA Adviser. We couldn’t be more thrilled with him taking this role, as he has been advocating for citizen science from behind the scenes since the inception of the Association. The ACSA Management Committee also took the opportunity to outline our priorities for the upcoming year. These include: evaluating the conference and our strategic plan, outlining the benefits of regional chapters, and refining our working group process, just to name a few. Erin Roger, second from left, presenting ACSAs achievements and future goals, along with the rest of the ACSA Management Committee Michelle Neil, Ellie Downing, Amy Slocombe, Kylie Andrews, Paul Flemons, Jenn Loder, Alexis Tindall and Jessie Oliver. they must make the world a better place. An overview of Dr. Finkel’s speech was published via Conversation. 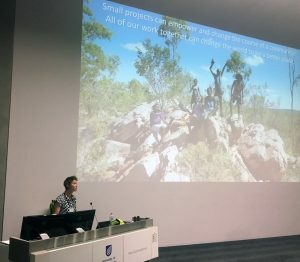 Dr. Emilie Ens spoke of the brilliant citizen science outcomes from the Ngukurr Wi Stadi bla Kantri (We Study the Country) Research Team, which are working to protect the environment and actively maintain endangered cultural knowledge. This project is conducted in affiliation with Macquarie University, Yugul Mangi Rangers, and Ngukurr School, and was the recipient of the 2017 Department of Industry, Innovation and Science Eureka Prize for Innovation in Citizen Science. Perhaps I was the only sook in the crowd, but learning of this project’s profound community outcomes and Dr Ens passion for the people she works with choked me up! Dr. Caren Cooper, author of the book Citizen Science: How Ordinary People are Changing the Face of Discovery, from North Carolina State University, U.S. gave a great talk providing a historical perspective on citizen science and demonstrating how the science from citizen science projects can feed into social activism and create broad-scale change. Amy Sterling, Executive Director of Eyewire, a project hosted at Massachusetts Institute of Technology (MIT), U.S. showed us live how you can play a game to map the brain, while demonstrating how crafty platform designs, gamification, community building, and providing tools for citizen scientists will not only engage them to participate, but also to help develop new features to the platform! Live chatting players caused the conference attendees to roar with laughter a few times! The conference affiliated public lecture was also a roaring success with over 300 people attending! Dr Leanna Read South Australia’s Chief Scientist opened the event, which was sponsored by the Government of South Australia, where Caren Cooper and Amy Sterling gave headline talks. Our very own ACSA volunteer social media moderator Michelle Neil also joined the Q&A panel! We were lucky to have ABC journalist Jessica Harmsen be the master of ceremonies (MC) for this event. You can catch a listen online via the Hawke Centre. Episode 3 of the 4-part series of The Crowd and the Cloud was shown at the conference, but if you missed it, or would like to view it or one of the other episodes, the are all freely available online. If you would like high quality videos for public screenings, let us know. Getting our citizen science on outside & unwinding! 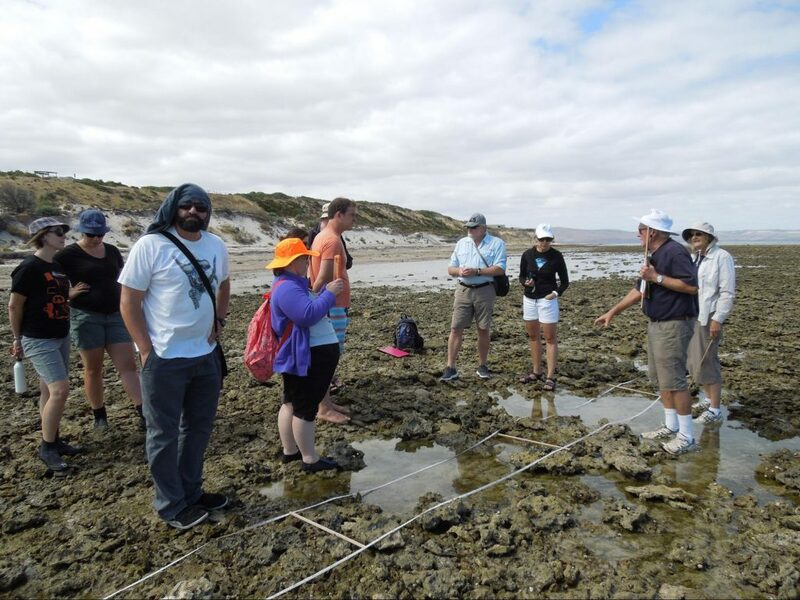 We rounded off the conference with two days jam packed with field trips which allowed delegates to tour Adelaide and surrounds, and learn about South Australian based citizen science projects. The inclusiveness, awesomeness, and fun of our citizen science community was also highlighted for me on a personal level many times! For example, folks were all too happy to help to get me exploring those rocky reefs without anything other than my feet getting wet! 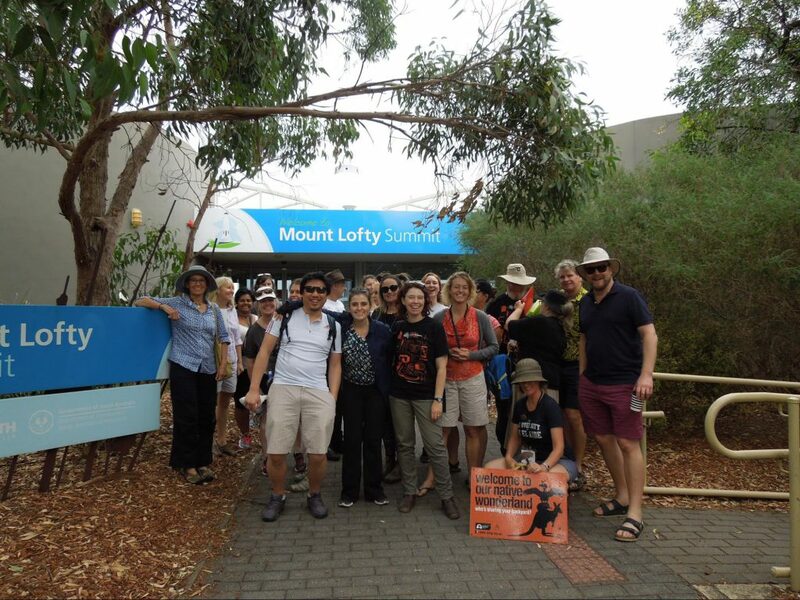 The Mount Lofty Tour Crew from #CitSciOz18 has arrived! Look out world! Andrew Tokmakoff in action showing us one way smart phones can be used for citizen science in the field. 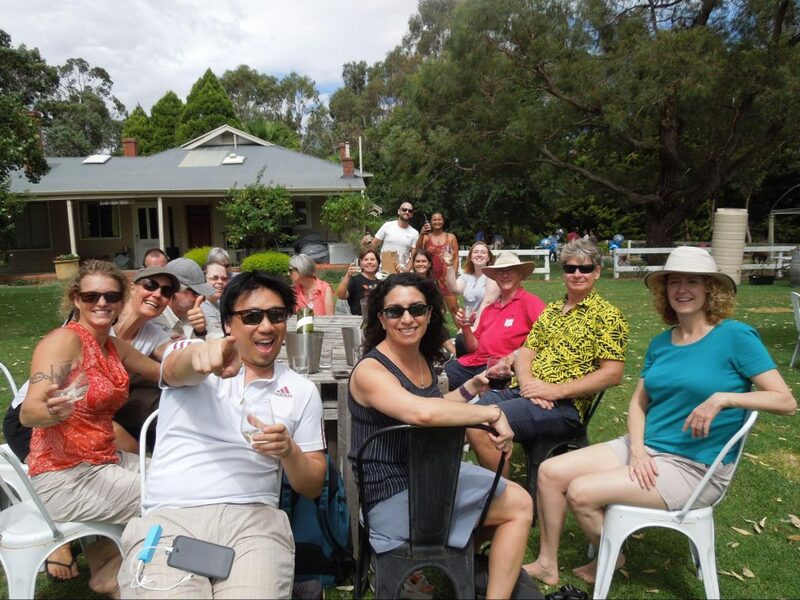 Some #CitSciOz18 winery tour bonding! 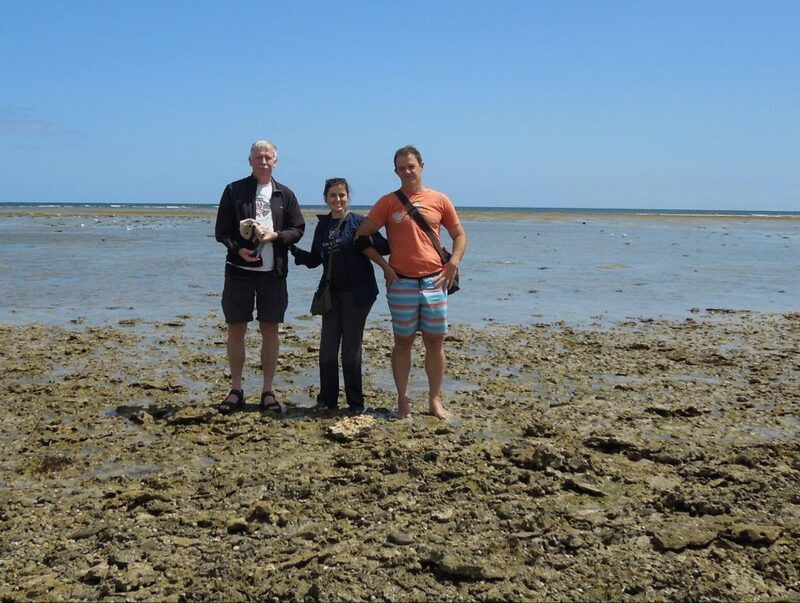 No trip to South Australia coastline would have been complete without doing some ReefCheckSA citizen science! Two legendary fellas H.J. van der Woerd and Kade Mills graciously ecorting Jessie Oliver across the rocks like a gazelle! #CitSciOz18 Makes the Big Time in Media! 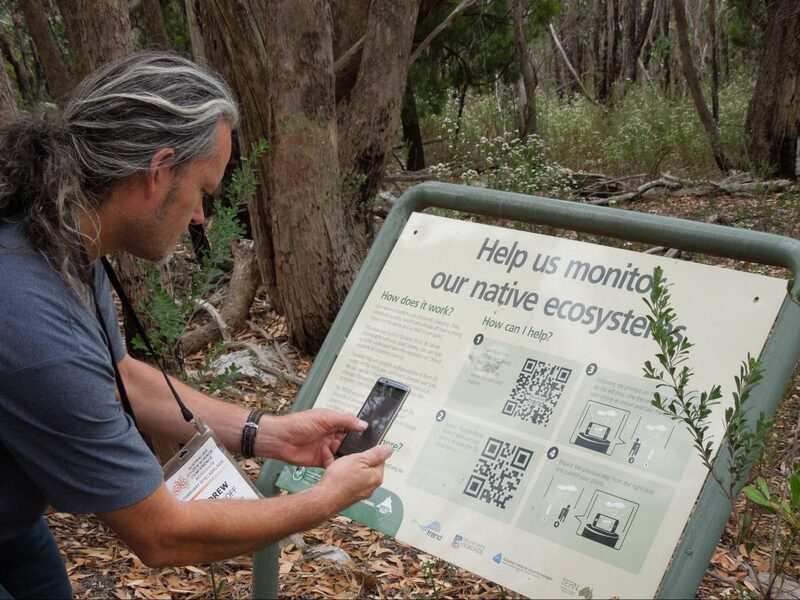 “How a German migrant planted citizen science in Australia – and why it worked”. 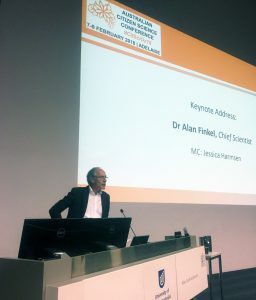 The Conversation, by Dr. Alan Finkel based on a speech Dr Finkel delivered to the Citizen Science Association Conference 2018 in Adelaide on 7 February 2018. “The App Sending Gamers Out into Nature“. The Wire with Andrew Robinson, CEO of QuestaGame. Aired 21 February 2018. 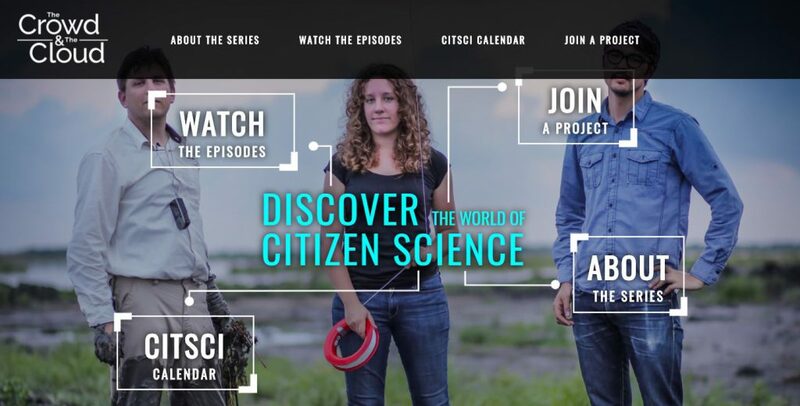 “What Is Citizen Science?” The Wire with Caren Cooper, Associate Professor at North Carolina State University and North Carolina Museum of Natural Sciences. Aired 14 February 2018. 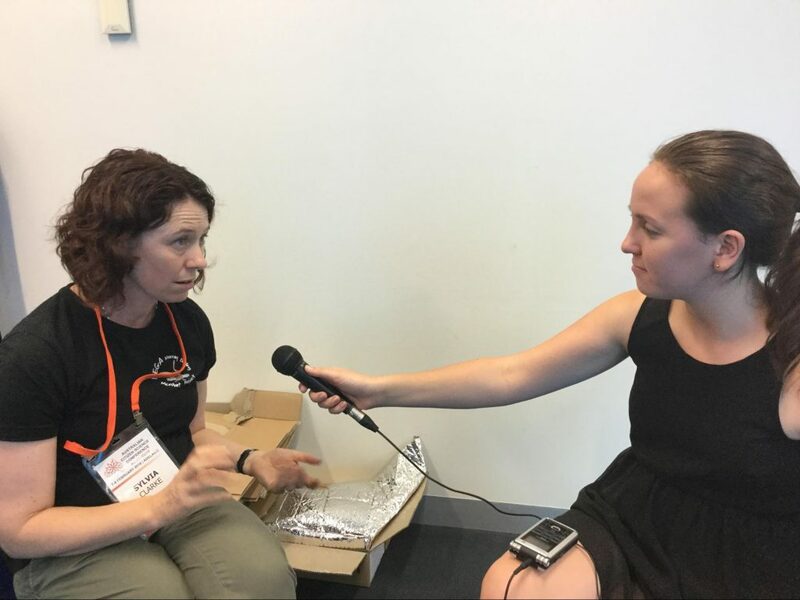 “How collaborative science is teaching us more about Arnhem Land”, The Wire with Dr Emilie Ens about the Ngukurr Wi Stadi bla Kantri (We Study the Country) Research Team’s biodiversity citizen science. Aired 15 February 2018. 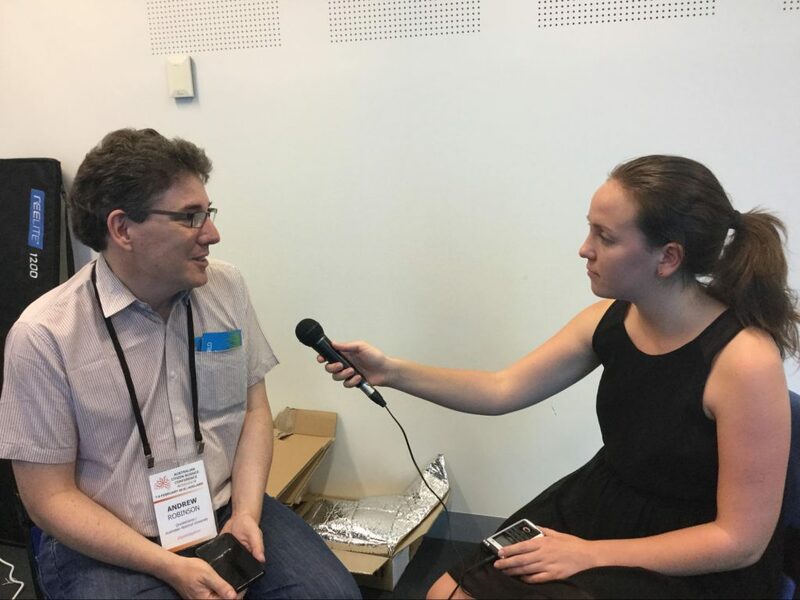 “Gaming is helping researchers map the human brain”, ABC Radio National (ABC RN) Breakfast with Amy Sterling about the citizen science project EyeWire. Aired 9 February 2018. LIVE SHOW! 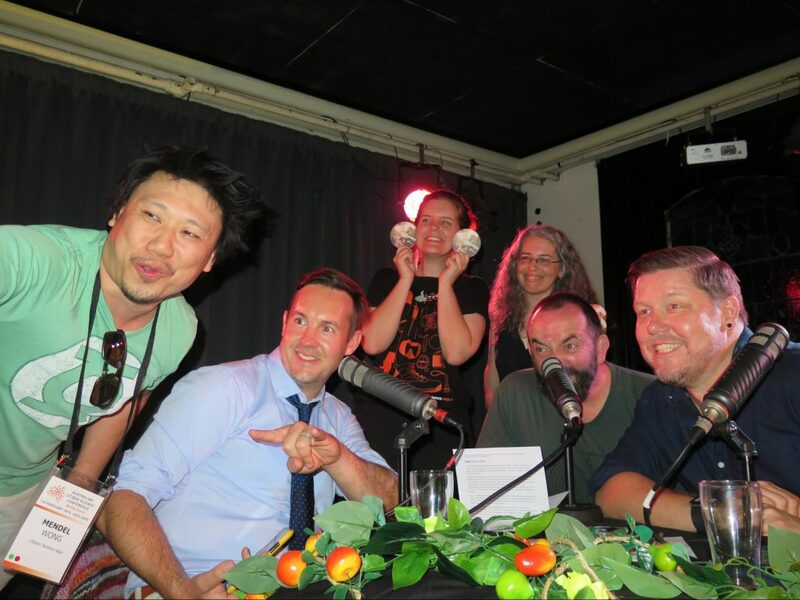 Licking toads for science at CitSciOz18”, The Wholesome Show live podcast,Aired 07 February 2018. It included four cheeky interviews including Ellie Downing (your hilarious ACSA secretary), Mendel Wong (co-Founder of citizenscience.asia and Zikathon), Stuart Harris (featured in MARATUS: Peacock Spider Documentary), and Caren Cooper all sharing with the public fun anecdotes of their citizen science involvement and experiences. 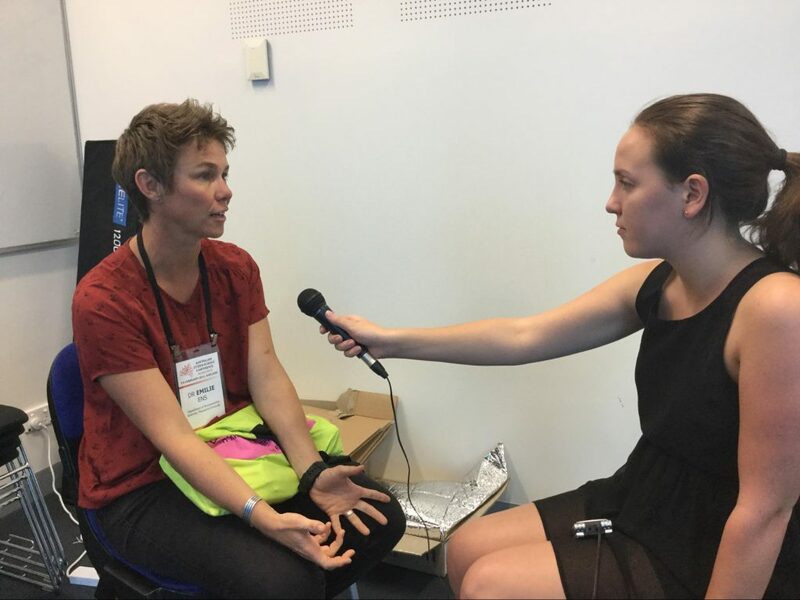 ABC Radio Canberra also conducted a live interview with Erin Roger, ACSA Chair. A number of competitions were held during the conference, and we would like to congratulate our winners once again! They picked up some terrific prizes including copies of Caren Cooper’s book “Citizen Science: How Ordinary People are Changing the Face of Discovery“, 60x microscopes, ACSA t-shirts and more! #CitSciOz18 Ways to Find & Share Info! You can review the conference agenda/program and the Book of Abstracts via the ACSA website. 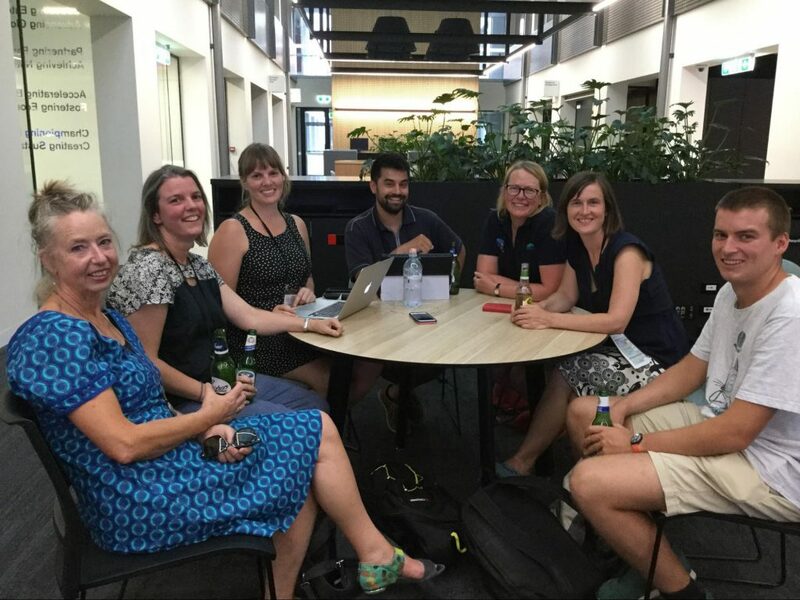 Members of ACSA can create and join special interest discussion groups, and this group is for those would like to further discuss any aspect of the #CitSciOz18 Conference. Did the conference, for example, help you make vital collections, foster collaborations, or provide learning applicable to your work? The ACSA Management Committee would love to know conference related feedback, testimonials, media, and outcomes! Please share what you liked most and what you hope to see in the future, as well as what you would like to see come out of the conference from this point forward. Many thanks in advance for any information you provide! Members, just log into the ACSA website to join in the conversation! Share outcomes, testimonials, learnings, or other feedback directly! If you would like to share these conference experiences aspects with us, you can do so via a direct private message via the ACSA website. We will be using your testimonials and outcome accounts to garner further support for future events. We are also keen understand what the learnings were for attendees of #CitSciOz18, and are hopeful that you as community members would be interested in contributing to white papers assessing key conference learnings broadly. If you’re keen to contribute send us a message on the website! Be sure to check out social media to explore conference happenings, whether for the first time or to reminisce about the fabulous happenings and glorious people! Luckily, many conference goers were furiously exchanging ideas, experiences, talk highlights, posters, and discussion via the conference hashtag #CitSciOz18 on twitter and facebook. Our social media moderator, Michelle, has been busy downloading photos and organising tweets! Enjoy the moments from Day 1, Day 2, the Public Lecture, Day 3 and the weekend field trips & reflections! If you haven’t already, sign up for the ACSA Newsletter to keep up with all things ACSA and citizen science happenings across the nation. This conference would not have ever been possible without each and every one of our generous sponsors. What a privilege it has been to volunteer for a community of such incredibly passionate citizen science enthusiasts near and far who collectively made this event so unbelievably wonderful! We thank each and every one of you personally for all of the diverse ways you contributed! Much of the conference was indexed thanks to folks tweeting at the conference and we would also like to give special thanks to those overseas tweeting from afar and helping to share the great work of our Australian citizen science community! Become a Member of ACSA! You will have new networking opportunities through our new member directory! Join your new chapter in WA, SA, VIC or be the champion to start one in another in QLD, NT, TAS, and ACT. See here for more information. Consider joining the ACSA Data & Metadata working group, let us know and we will put you in contact with Peter! Join & share ACSA social media! Find us on Twitter, Facebook, and LinkedIn. Many thanks for your interest in #CitSciOz18! Jessie Oliver on behalf of both the ACSA Management and Conference Committee members. The Conference Organising Committee: Michelle Neil, Frank Grutzner, Sylvia Clark, Alexis Tindall, Jessie Oliver, Erin Roger, Amy Slocombe, Philip Roetman, Tahlia Perry and Ellie Downing.